RR leg-spinner Shreyas Gopal bowled a sensational spell to dismiss key top-order batsmen before Patel, Stoinis propelled RCB to 158 for four. 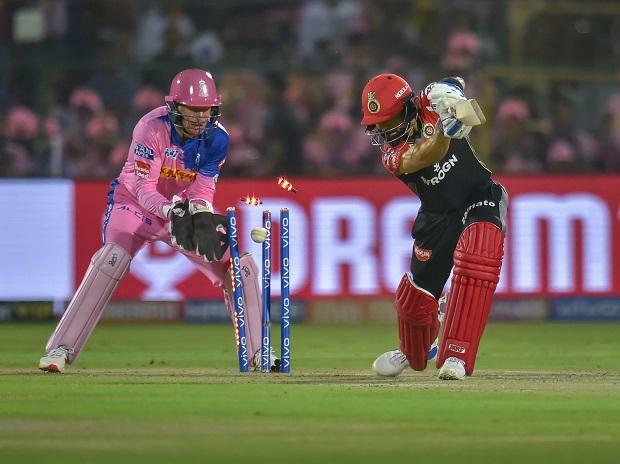 In Match 14 of VIVO Indian Premier League 2019 (IPL 2019), leg-spinner Shreyas Gopal bamboozled Virat Kohli, AB de Villiers among others with his googlies before Jos Buttler struck 59 as Rajasthan Royals finally won their first game of IPL 2019with a seven-wicket defeat of Royal Challengers Bangalore (RCS) at Sawai Mansingh Stadium in Jaipur on Tuesday. 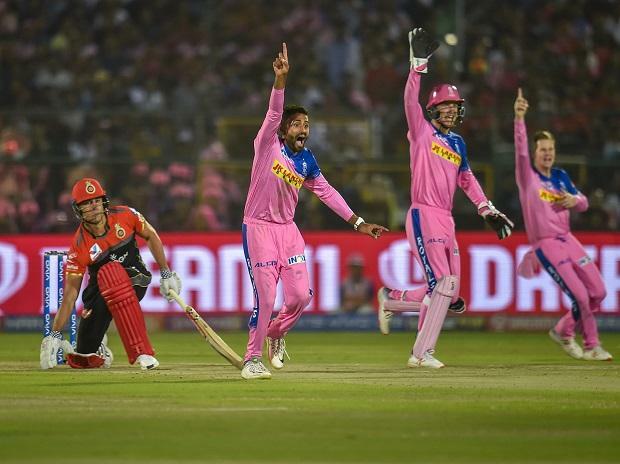 Gopal claimed three wickets, including that of Virat Kohli (23) and AB de Villiers (13), conceding just 12 runs in his four-quota over to unsettle RCB. It was opener Parthiv who resisted the Royals attack with aplomb, hitting a belligerent 67 off 41 balls with nine boundaries and six to help his side put 158 for four after being sent in to bat. Marcus Stoinis (31 not out) too played a key part in shoring up team's total, add 32 quick runs in partnership with Moeen Ali (18). Buttler led the chase with his confident knock as Royals overhauled the target with one ball to spare, handing RCB their fourth defeat in a row. RCB, who dropped plenty of catches in this match, are placed at bottom of eight-team table without any points. Buttler packed a lot of power in his strokes and went on to score his second fifty of the season. He hit eight fours and a six on a wicket which got slower as the game wore on. Royals were off to a steady if not fiery start with Ajinkya Rahane (22) and Buttler adding 60 runs for the first wicket. Rahane was dropped on 1 by Kohli off Mandeep Saini but the skipper did not utilise on the reprieve as much as he would have liked, getting trapped by Yuzvendra Chahal (2/17). Buttler and Steve Smith (38) added 44 for the second wicket but Chahal struck again, dismissing the British batsman. Chahal could have got the Australian as well but Umesh Yadav dropped a sitter near boundary line when Smith on 23. Smith went on to add 50 runs for the third wicket with Rahul Tripathi (34 not out), who finished the match with a six in the penultimate ball of the match. Immediately after that, Gopal was introduced into the attack and he began to trouble the Indian captain with his googlies. Gopal deceived Kohli with one, which went through the gates. The leg-spinner returned and this time got rid of de Villiers with another wrong one which stopped a bit as the South African hit it straight back to Gopal, who bowled a rare wicket-maiden. Left-handed Shimron Hetmyer became his third victim when he edged one away-going delivery and Jos Buttler took a sharp catch behind the wicket. Parthiv was still there but boundaries had dried up. The diminutive left-hander finally lofted one from Ben Stokes for a six over mid-wicket and followed it up with a crushing drive on the off side. He completed his fifty with a single off Archer, who was smacked for a six by Stoinis soon after. The West Indian dismissed Patel later.